Healthy eating practices start at the dinner table. Laurie David, author of The Family Dinner, talks about why family meals are essential for children’s growth and development. 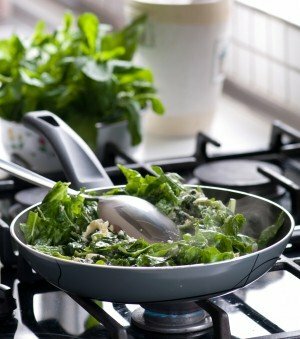 What sort of education happens in the home kitchen and at the dinner table? Laurie David: The kitchen is the best place in the house to practice and teach green values, such as buying food locally, in season, and organic; using cloth napkins and real glasses, plates, an utensils; and growing your own herbs and composting. All of these choices and actions help us to live more sustainable, healthy lives, while also saving money. The dinner table is where we learn how to debate and listen to each other. Parents model conversation skills every time they have a discussion. It’s a great place for verbal games and teaching word definitions and spelling. Everyone can learn something while having fun. Eating together also teaches gratitude. Dr. Wendy Mogel says that gratitude is a muscle, and it needs to be exercised. What better place than at family dinner, where there is much to be grateful for? 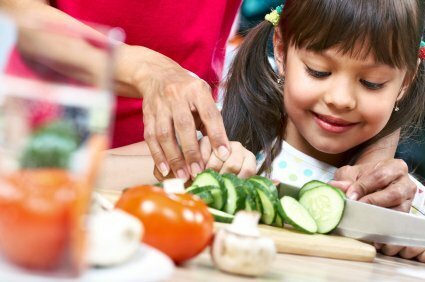 Why is it important to involve the whole family in the meal prep process? Laurie David: By giving a couple of simple jobs to your family members, they will become more engaged. When a child helps in making a meal, they take ownership and pride in it, whether they just stirred the bowl a few times or helped in a considerable way. Kids are more likely to try new foods if they’ve had a hand in prepping the meal. They are going to learn that cooking isn’t a chore, but instead a fun way to spend time with their family, creating something of value that can be shared by many. Everyone can help clean up after the meal, too. 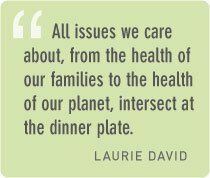 Laurie David: All issues we care about, from the health of our families to the health of our planet, intersect at the dinner plate. I believe the food movement is going to eventually engage everyone, because we all have to eat. The way we are eating is completely unsustainable, and it’s killing us. Diet-related illness is the number one killer in America. Many of us are unaware of the impacts of our food choices on our bodies and the planet. It’s time to wake up. We as citizens need to demand more from our government in terms of the safety of our food. We all need to take a little more personal responsibility, as well, becoming educated, sharing what we learn, and growing a little food ourselves. Laurie David is a mother, environmentalist, and author of The Family Dinner: Great Ways to Connect with Your Kids, One Meal at a Time. She produced the Academy Award-winning documentary film An Inconvenient Truth. She also wrote the bestselling book Stop Global Warming: The Solution is You! and The Down to Earth Guide to Global Warming (co-authored with Cambria Gordon). Learn more about Laurie and discover family mealtime tips at www.thefamilydinnerbook.com.